So... in our local news this week our little city has apparently just had it's ninth shooting (of the week). Last weeks the news included a report that the school district we happen to be in scored in the lowest 5% in the state (which was kind of shocking, even after following the statistics on roughly half the students dropping out before graduation, because I still would have thought we would have had a slightly higher percentage ranking simply because we're in the same state as Flint and Detroit who both rank so high on those yearly crime lists when they're released). and then couldn't find nail polish remover... for weeks. And I think Paul is finally thinking I'm a little less silly when I pause and say "fireworks or gunfire?" when we hear those familiar pop, pop sounds at night (probably because working nights just a few miles away and being in the law library so much for the past two years he hasn't heard nearly as much of it as we do here in the house... and I'm feeling about a million times safer with him being home so much more.). 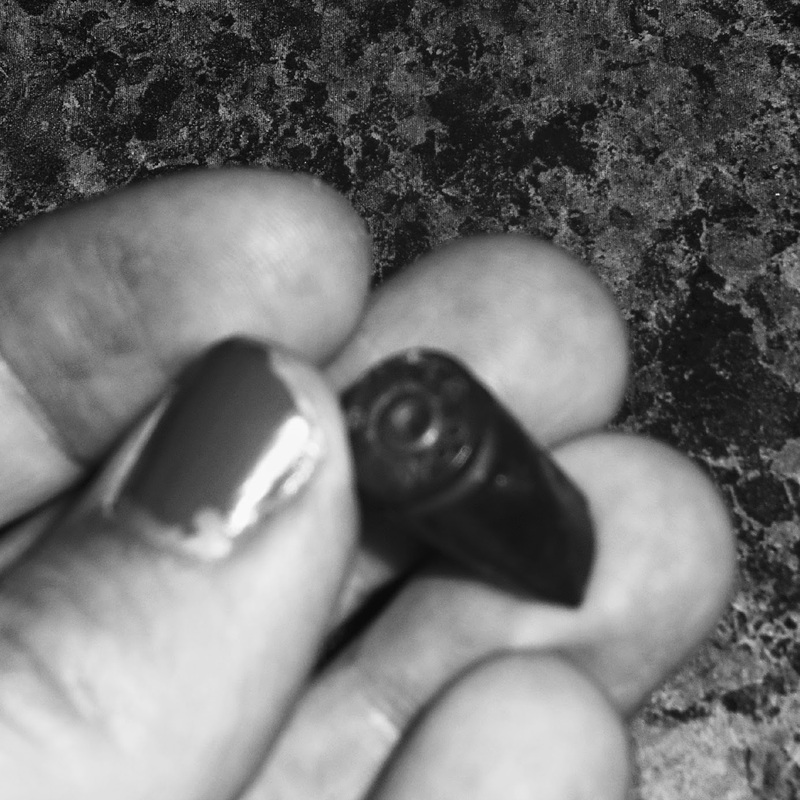 Yesterday I had a solid half hour of panicking when I found out that the Paypal buttons on the chaplets page hadn't been working and had been saying that most of the chaplets I had up were sold out (they weren't!). I erased and recreated the page, and while it definitely needs more work on descriptions now, it is up and working again. And I added two of my all time favorite chaplets, both versions of the chaplet of Saint Kateri Tekakwitha. 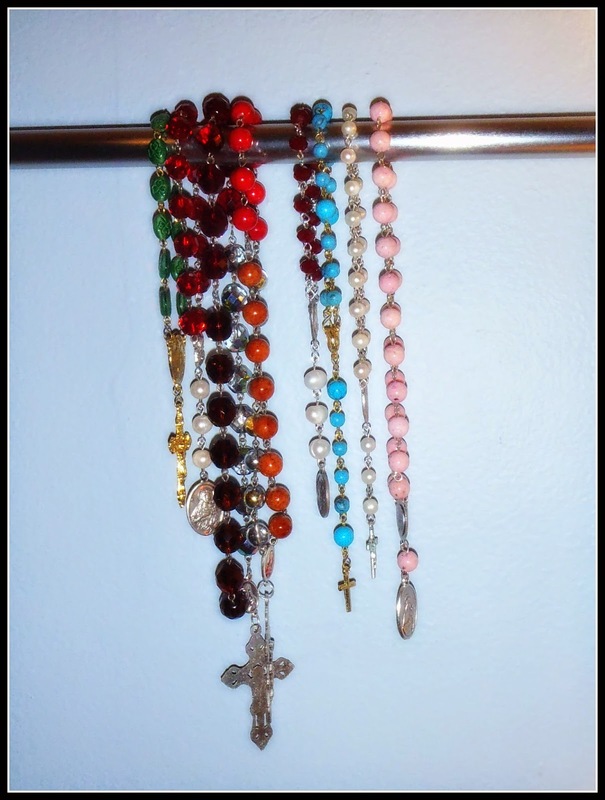 Little by little I'm getting the chaplets and rosaries that I've made over the last few years photographed and placed on the page so there should be a few going up each day! 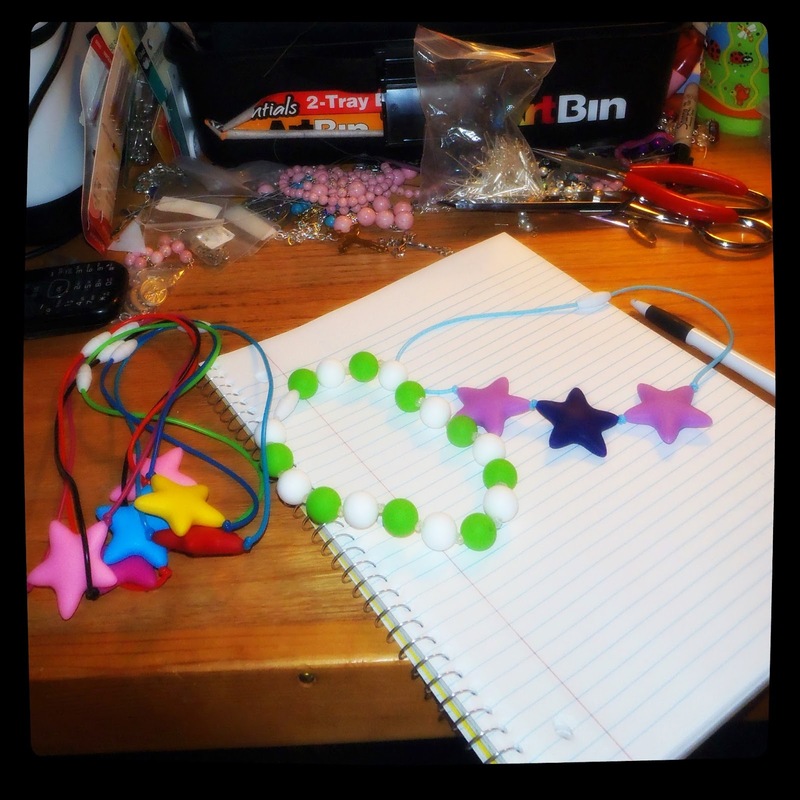 Last night I cut out the fabric for a few mermaid projects that I'm working on so that I can have examples up of various mermaid-options. 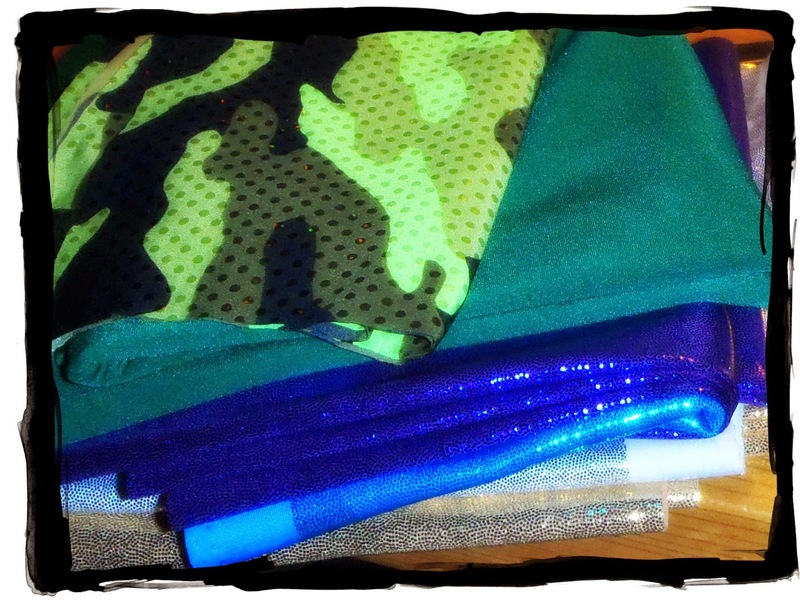 The camo-sparkle fabric on top is for a certain 21 month old who wants costumes that are shiny like his sisters. He's also a big fan of frogs as of yesterday (who knows how long that will last) so maybe I can figure out some sort of frog outfit... because I have a feeling he would not do as well as his sisters do at hoping around in a tail... even if he thinks they look really fun! This picture just doesn't do justice to the fabrics colors! Me: "Ouch! That's not nice Patch! Why did you do that?" Monday morning I have another doctor's appointment because we're up to the "appointment every two weeks" point. Which leads me to wonder where this pregnancy has gone. Because I feel like it started about five minutes ago, the way the last almost eight months have zoomed on by. The new baby is going to be here before we know it! Sometimes it feels like each pregnancy has gone faster than the one before it. Probably because certain someone's are keeping me too busy to think about how many weeks have passed! Every two weeks, already? Wow! That's so exciting!! yes, even out here in the boonies people don't seem to realize bullets don't stop at the property line. My husband is very careful when shooting (ground hogs mostly). He won't shoot toward the highway or the house or the neighbours (even though they are rather far away). I couldn't imagine living in town and finding shells. 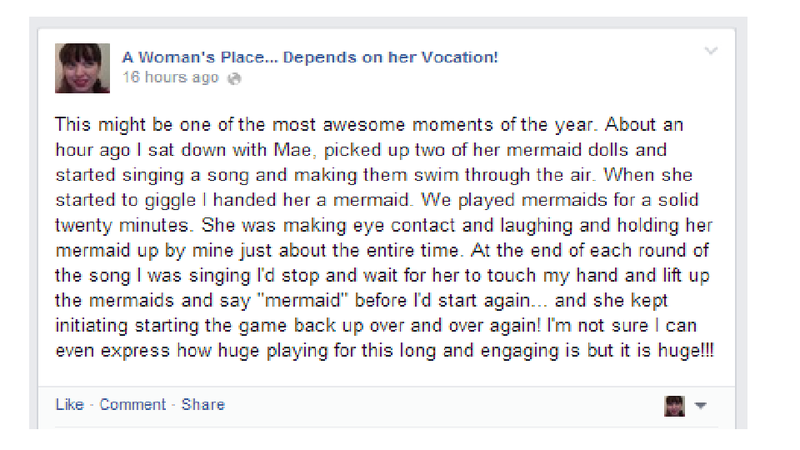 Hurray for Mae and her mermaid play. It makes all the hard work worth while. Our town is fairly peaceful. Three Catholic churches from which to choose. 24/7 adoration. Three seminarians. Happy Feast of Saint Augustine! Happy Feast of Saint Rose of Lima! The Triumph of the Morning! For the Month of August! 7 Quick Takes Friday: Mae Bae Update Edition!